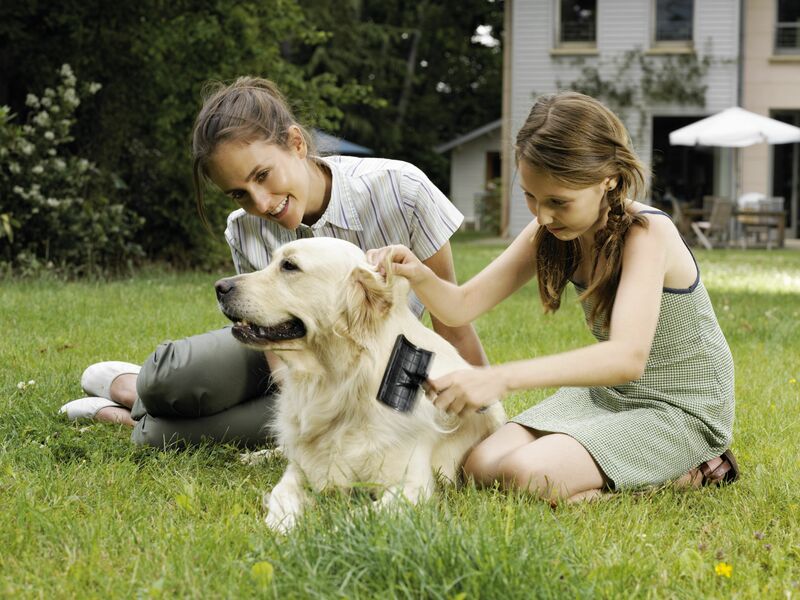 Dog grooming is one of your dog's basic needs and an important part of dog ownership. Just like people, dogs need physical maintenance to look and feel their best. Fortunately, dogs do not need to bathe as often as people, but you do need to learn how much grooming your dog actually needs and keep it on a schedule. Generally, a dog’s grooming needs depend on the breed and hair type. If your dog has a skin, ear or nail condition, follow your veterinarian’s instructions regarding grooming your dog. It is also important to use the appropriate grooming tools. Regardless of hair type, you can brush your dog daily - especially if he enjoys it. Regular brushing will keep the coat shiny and healthy. More frequent brushing during shedding season can help prevent hair build-up and excess shedding. Consider products like the FURminator deShedding tool or the Bamboo Shedding Blade. Bath time does not mean fun to most dogs and owners. It may bring forth an image of a wet dog running from the tub, dripping all over the house. Bathing does not have to be this way if your dog can get used to it. He may not like the bath, but he’ll be easier to manage. Learn how to bathe your dog properly and make the experience as positive as you can for you and your dog. Most dogs only need to be bathed when they seem dirty or itchy. Many people like to bathe their dogs monthly, but bathing as often as once a week is not considered harmful. Always use a soap-free shampoo that is intended for dogs. Depending on the condition of your dog’s skin and coat, your veterinarian may recommend a specific shampoo. In this case, be sure to follow your veterinarian’s instructions about bathing.